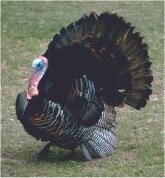 Good Cooking's Basic Turkey Cooking Guide, Yes, a Guide and Not a Recipe! Preheat oven to 325 or 350 F (see chart below) at least an hour before you put the turkey in. Remove the neck, liver, and other body parts from the turkey. Rinse the turkey inside and out twice with cold water and pat dry with paper towels. Place on several sheets of plastic wrap or aluminum foil (this keeps your workspace clean) to season. Brush the turkey with oil, margarine or melted butter and season with salt, pepper or your favorite seasonings inside and out. Cut off the wing tips if you like and save for a stock. Truss the turkey (tie with string) or use the plastic or metal clamps supplied with the turkey. Place the turkey on its side on a wire rack in an uncovered roasting pan. Discard the aluminum foil you seasoned it on and once again wash the area you were just working in with disinfectant soap to prevent cross-contamination of the work surface. Turning the turkey and roasting on all sides for an even doneness is a restaurant's secret! Roast at your set temperature. Start the roasting on one side, turn to the other after 45 minutes. Roast another 45 minutes on the other side and finish breast up, tented with foil (to keep the breast moist) if you like. Note that a 16-18 pound bird will take about 4 3/4 hours. You need to take into consideration that you will be turning the bird and opening the oven door several times. This will lower the oven temperature and increase the cooking time. This is why my time is longer than the 3 1/2 hours that other recipes call for a similar size bird. Most recipes pretty much cook the turkey in one position and basting may or may not occur. Adding a mirepoix after the first 45 minutes of roasting will give you great flavored pan juices to use for a gravy or all by itself. For the mirepoix: use 2 cups thinly sliced onions, chopped celery, chopped carrots and 3 cloves of garlic added to the pan. Start basting with the pan juices every 30 minutes after the first turning of the bird and do it quickly as not to lower the oven temperature too much. After another 45 minutes of roasting, turn the bird breast side up for the final length of cooking time. At this point I recommend tenting the breast with a loose sheet of aluminum foil to prevent the meat from drying out---continue to baste evey 30 minutes. To check for doneness: internal temperature should reach 165 F. when a thermometer is inserted in to the turkey's thigh at the thickest part, or the turkey's timer should pop up. Remove the turkey and let stand 30 minutes before carving. Oven temperatures vary greatly from oven to oven so it is highly recommended to buy a good quality oven thermometer to check your oven and become familiar with how to adjust the oven's dial to correspond with the desired temperature. You may also call a service technician from your stove's manufacturing service center to calibrate the oven's controls. Do this a few weeks before your holiday feast! Variables such as how many times you open the oven door and cooking other items in the oven with the turkey, will affect the above times---use it as a guide and remember that the only true way of testing doneness is to use a probe thermometer, inserted in the thigh bone area, where it meets the carcass bone. Safe food handling guidelines suggest a turkey be cooked to an internal temperature of 165 degrees F.
Use the above guide or check out our Java Script Turkey Cooking Time Calculator. It's a computer generated app with more helpful information! Turducken!--- It's a turkey stuffed with a duck and a chicken---Warning---I hope you have patience to tackle this one! When you're done only one word will describe it, Wow! Original and never copied from another website---recipes for your Feast! Now that dinner is over, what are you going to do with all of the leftovers? Never fear, Good Cooking is here! Here are six easy recipes that will help get out of the leftover holiday turkey rut. Leftover mashed potatoes become-----Vegetarian Curried Vegetable Cutlets! Leftover squash becomes-----Golden Squash Soup with Sage! Leftover cranberry sauce becomes----Low Fat Lemon and Cranberry Cheese Cake! Leftover white meat becomes-----A Triple Decker Turkey Club Sandwich!